Wash lemon, finely grate peel, and cut into 4 quarters. Wash artichokes, break off stems, and cut off leaf tips. Rub lemon on cut-ends of artichokes. Place lemon slices in plenty of salted water and bring to boil. Cover and cook artichokes for 45 minutes. Meanwhile, thaw and drain Wild Blueberries. For the Mayonnaise: Mix mayonnaise and yogurt together. Season with lemon zest, salt, and pepper, according to taste. Fold in 1/3 of the Wild Blueberries. For the Vinaigrette: Peel and dice shallot. Mix shallots, vinegar, vegetable broth, 2-3 tablespoons water, salt, pepper, and a pinch of sugar. Beat 1 tablespoon olive oil into vinaigrette. Fold in half of remaining Wild Blueberries. For the Salsa: Wash tomatoes, cut into quarters, and remove seeds. Finely dice the tomatoes. Wash lime, pat dry, and finely grate the peel. Squeeze out juice. Cut chili pepper lengthwise, scrape out seeds, and finely chop. Pick basil leaves and cut into thin strips. Mix tomatoes, lime zest and juice, pepper, 1 tablespoon olive oil, basil leaves, and remaining blueberries. Drain artichokes. 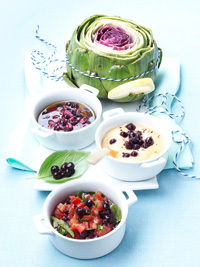 Serve together with the three Wild Blueberry dips.Serves 4.